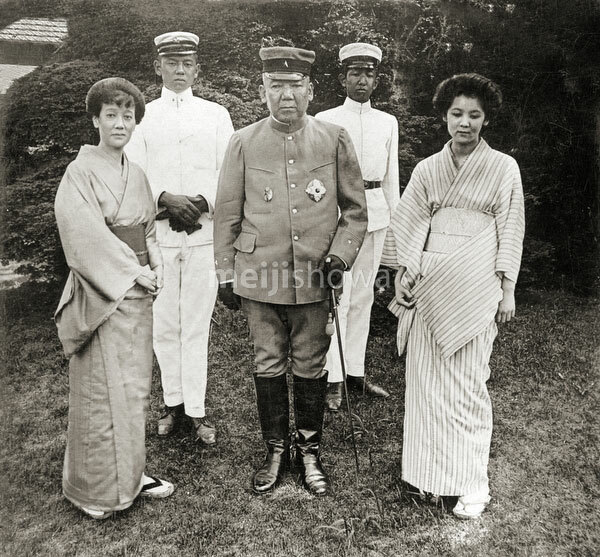 Japanese field marshal Iwao Oyama (大山巌, 1842–1916), with wife (left) and children in the garden of their home in Tokyo, ca 1905. Born in Kagoshima to a samurai family of the Satsuma domain, Oyama was one of the founders of the Imperial Japanese Army. During the Russo-Japanese War (1904-1905), Oyama was commander-in-chief of the Japanese armies in Manchuria. In 1871, Oyama’s future wife Sutematsu Yamakawa (山川捨松, 1860–1919) was one of the first female students sent to the United States. She graduated from Vassar College in New York in 1882 (Meiji 15).